Two petrol stations on the link from the A1 to the A19. The former Total petrol station. The northbound petrol station is now known as Gristhwaite. The northbound service area is built on a former brick and tile works. A garage was built here operated by Thirsk Motorway Services Ltd, named Midway services. In 1974 there was a plan to add a motel here. In 1976, BP significantly expanded the site under the name Halfway Garage, named after the Halfway House which is positioned behind it. There was a small café here, which in 1981 Little Chef wanted to replace with one of their restaurants, but the new diner actually opened as their sister brand, Happy Eater. 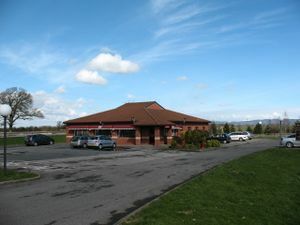 In 1993 this became a Little Chef, which closed in February 2012. In late 2012 it became Mama B's restaurant, which closed in September 2013 due to low customer usage. It is now sat empty and up for sale. 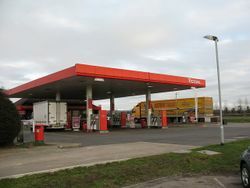 The forecourt later became Total, and in 2011 changed to Shell. The southbound petrol station was built in around 1988, with the diner opening three years later. It promotes itself as being the last restaurant "for over 50 miles". Fuel was provided by Jet and is now BP, operated by MFG.